There is updated information as of 4/13/2019!!! 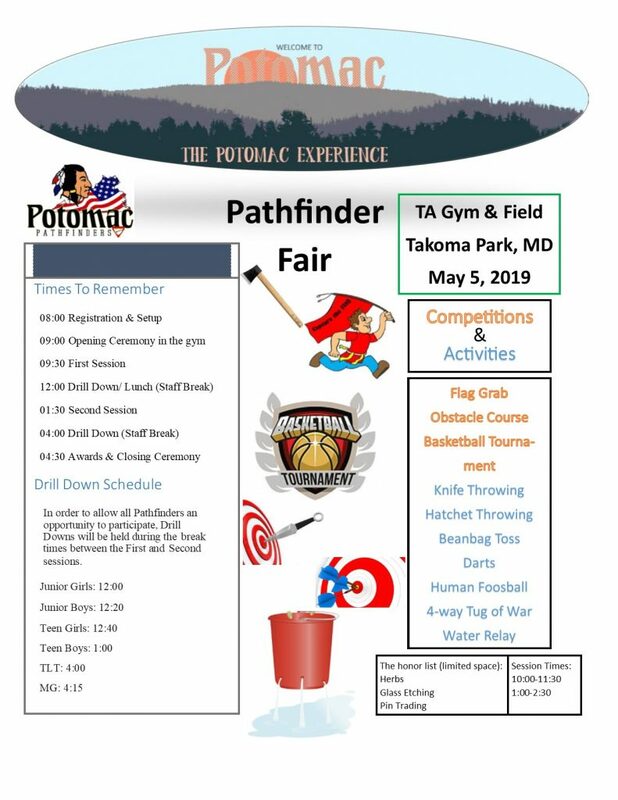 It is time to register to attend the 2019 Potomac Pathfinder Fair. Check your calendars. It is set to happen on May 5, 2019 at the Takoma Academy campus. Below is the Flyer for the Fair. It includes a list of times and activities. Please take time to click on it to see the full sized downloadable PDF. 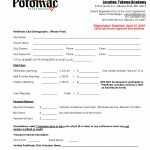 Arrive on site at Takoma Academy at 7 am sharp to assist with the site setup and will be required to sign in at 7am. Plan on working until no earlier than 6 pm. At that time they will sign out in order to receive the $12 credit to your club’s registration per volunteer. A maximum discount total of $24 dollars will be credited to each club’s registration for 2 or more volunteers. Clubs are welcome to bring more than 2 volunteers to work at the fair but will not receive extra discounts to your club registration for having more volunteers. All adult volunteers must be Verified Volunteer Compliant and have had their background check option marked in the system. We are asking all clubs not to bring adult volunteers on site to help the conference and/or pathfinder clubs who have not gone through the Verified Volunteer training and background check. This compromises the safety of our pathfinders and destroys the integrity of the process the North American Division has put in place for our kids. We request that TLTs to sign up at the TLT volunteer station to work for 4 hours per TLT for the Pathfinder Fair event. TLT need to sign up and sign out at the TLT table in order to receive volunteer hours. If you have special volunteer forms from your respective high schools, please bring them at that time to be filled out. Please register for the fair by filling out and emailing your club registration and the food booth forms. You will find links below to the forms. Spring 2019 TLT Convention will be a lock-in held at the Fredericksburg SDA Church, March 9 & 10. 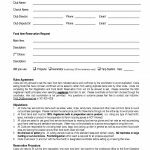 Below are PDF files of the registration to print, fill out and email back and the schedule for your information. Please respond soon so we can have a headcount for planning supplies and food purchases. We will begin Sabbath afternoon at 3 PM with workshops, supper, sundown worship, and, as always, Super Fun Something in the evening. We will be staying overnight in the gym, so bring your sleeping bags and pads. We’ll have breakfast Sunday morning, continue with the remaining workshops and be finished by 12:30 PM. There will be warm fuzzies as usual and your favorite workshop facilitators. In this Oshkosh year, we are trying to help conserve your funds to attend that life-changing event. So this TLT event is only $40 per person and includes Sabbath Supper, Sunday Breakfast and a sack lunch. Please register now to facilitate our planning to make this event special for your teen leaders. Make sure your TLTs remember to bring their binders so they can get signed off on their workshops. We are excited to spend some time with our awesome Potomac TLTs. See you soon! 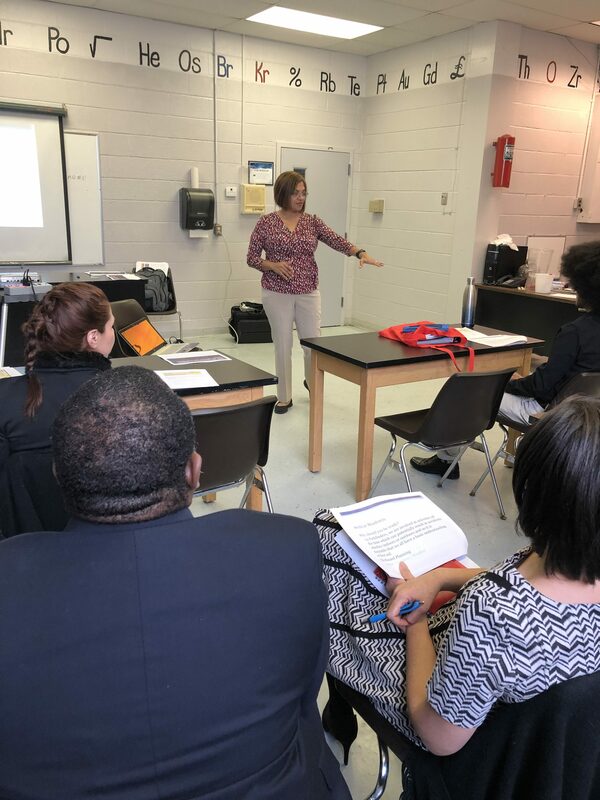 The next training seminars for Master Guides candidates will be November 17, 2018 at the Manassas Seventh-Day Adventist Church (9858 Fairmont Avenue Manassas, VA 20109). Please note that we will be teaching a special course in English for those pursuing the Pathfinder Instructor Award (PIA). There are no fees associated with this training. Please let us know if you have any questions. Many thanks. It is that time of year again. We have several updated documentation material to share with you all. This first document has our 2018 updates to the Pathfinder manual. 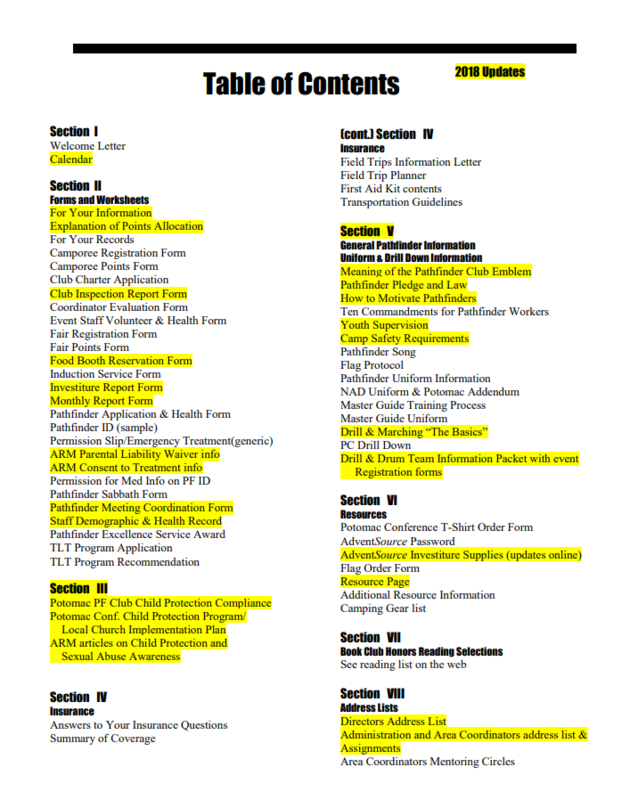 Each change is highlighted in yellow for you to review in the Table of Contents. This is the complete Directors Manual minus the contact information for each director. We have included a document that has Basic Drill Command instructions for you to use with your clubs, as well as, flag positions. There have been many questions about flag protocol. This document helps inform the reader of those important and respectful protocols. .
We hope this new documentation is useful for you and your clubs. It is always a joy to see young people make a decision to commit themselves and follow the example of our Savior by their decision to be baptised. So, with joy we announce and share the baptism of Reese Omwenga at the Potomac Conference Pathfinder Camporee 10/6/2018. May you be blessed. Clubs will sign up and pay for their honor participants at REGISTRATION. We are not doing any pre-registration for the honors. Each class period is limited to 30 Pathfinders per class. There are 2 classes for each of the honors. 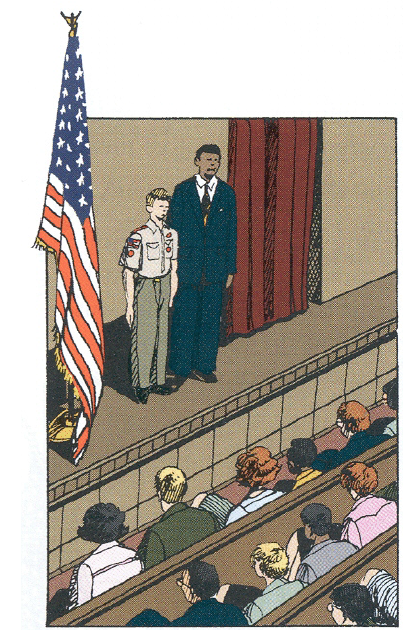 Which means that a total of 60 Pathfinders will be able to take each honor. Clubs need to pay for the honor slots when they sign up for them at registration. We will not be billing for these spots. No show means they paid for someone else to take the class (NO REFUNDS). Each club will be allowed to sign up 6 Pathfinders per class (they need to be accompanied by 1 staff person to assist the honor teacher). If there are open spaces when the class starts, additional Pathfinders from clubs already signed up will be able to take the vacant spots. The volunteer/pathfinder credit will be given AFTER camporee and Jeff Cooley signs off on their completed assignments. Clubs should include their volunteer and pathfinder for the credit in the registration numbers. As we prepare for the 2018-2019 Pathfinder year, we note that many clubs wish to introduce the Model Rocketry Honor but don’t have the facilities or expertise necessary for a safe launch. 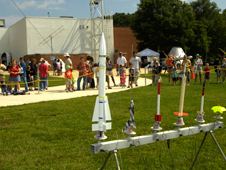 NARHAMS supports the oldest public model rocket demonstration launches in the United States. These launches have been part of the NASA Goddard Visitor Center programs since 1976. The launches are held on the first Sunday of each month at NASA‘s Goddard Space Flight Center, starting at 1 pm. Anyone who wishes to fly at these events may do so. Visitors may bring and prepare their own models; a group safety briefing is given at 1:00pm, and models are given a preflight safety assessment. They allow single-engine models that must not exceed D-class models. 1/2A or A models work best for their field. Due to the limited recovery area. the flying of high power models and untested designs is discouraged.They do not permit models whose altitude may exceed 2,000 feet, nor do they normally allow glider models. If you have any questions, please contact the NASA Goddard Visitor Center front desk at 301-286-8981. Weather decisions will be made the day of the launch — to check the status of a launch, please contact the Visitor Center front desk. “Children are the future of the church.” Many of us have heard this phrase time and time again, and with good reason. On their pathway to adulthood, children will often become involved with various ministries and services until they are ready for leadership roles. As leaders, it is our responsibility to care for and prepare them for those leadership roles within the church. We must also remember that they are still children as of now and must be protected and kept safe. The church should always be a safe environment for all children and a place where children can trust leaders. That is why implementing child protection and safety practices are crucial. Join David Fournier, vice president and chief client care officer for Adventist Risk Management, Inc. (ARM), in this webinar to review child protection guidelines, learn what leadership can do right now, and discover steps for quality supervision. This material is fact based general information provided by Adventist Risk Management®, Inc. and should not, under any circumstances, be modified or changed without prior permission. It should not be considered specific legal advice regarding a particular matter or subject. Please consult your local attorney or risk manager if you would like to discuss how a local jurisdiction handles specific circumstances you may be facing.